Precision machined to fit specific objectives. 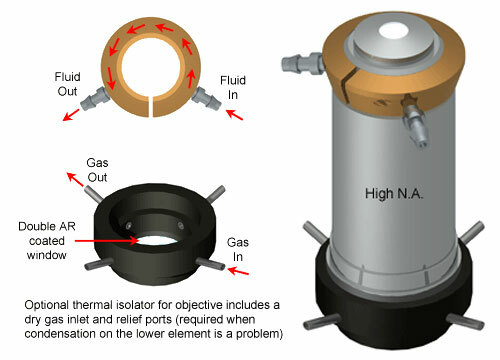 The Objective Cooling Collar is an attachment to an objective that provides an isolated pathway through which a refrigerated fluid can flow. this provides an efficient means of cooling the objective. The source of the chilled fluid can be as simple as a dewar of ice water or as sophisticated as an AC powered chiller bath. The removal of heat from the objective is more difficult than heating because you are limited by the thermal transfer efficiency of both the objective and the contact surface of the cooling ring. Therefore, the cooling ring needs to be of sufficient size to work. It is advisable to make sure you have enough room under the stage for the additional diameter required for the cooling collar and tubing. 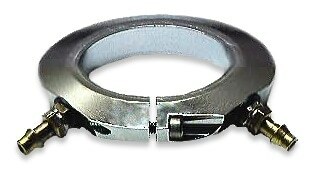 Cooling collars are precision machined to fit specific objectives.